In today’s modern market, you need to be able change and update as often as needed. Contact us to discuss options that include the most modern styles available, hosting, and domain based email. A modern website should not cost as much as they used to. Much like other aspects of your business, we all have access to better, cheaper ways to accomplish our goals. 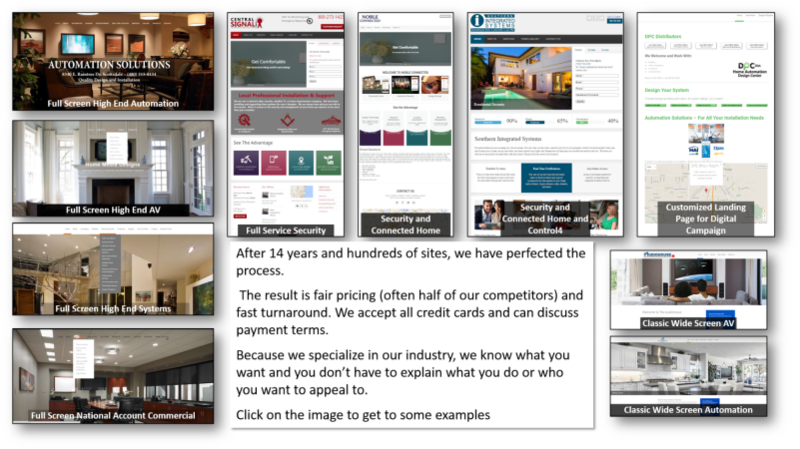 The new challenge is to provide a current website that reflects the ever changing offerings that appear. The old model of paying to educate an “artist” to create your site and then waiting for it to go stale; as it always will, needs to end. But, who has the time or money to redo their site every time there is a change? We can fix that with a six page site for under $900 and unlimited updates, changes, and hosting for only $50 per month. Additionally, we can also get you email with a real domain name. Elevate yourself from the world of that guy who mows your lawn to the professional you want to be. “ Systems@gmail.com” does not create a feeling of confidence. A real website and an email connected to it is the way the big dogs operate. On top of this page are examples of high quality websites with ongoing updates, hosting services, email services. Then, contact us to discuss our year end specials. For over 14 years, Group Gerhardt has provided the installation industry with the most advanced websites at the fairest prices. If you do not have a current website you don’t fit in a high tech business. If your website is embarrassing, you are better off without one.